Exploring the world of television and film crossovers, and the alternate realities of the big and small screen. What's a quickie? See this blog. Inspired by Matt Hickman's posting of Ross Pearsall's latest Lost Issue in the TVCU forum, today I'm going to do a quick covering of Alien and Predator. You can view the Lost Issues here. The TVCU discussion group is here. A Complete (but not updated) Alien/Predator crossover chronology can be found here. Predator and Alien of course started off as completely unrelated science fiction/horror films. They didn't even take place in the same time period. Predator was a contemporary film, involving an alien on Earth. Alien, on the other hand, took place in a dark future, one where humans hadn't discovered warp drive nor had they much contact with any other alien species. One commonality was that they were both about very dangerous killing machines that stalked their prey, killing them off one at a time. The first linking of the two came in Predator 2, when the skull of a an Alien (ok, Xenomorph at they are technically called) is seen on the Predator's ship. 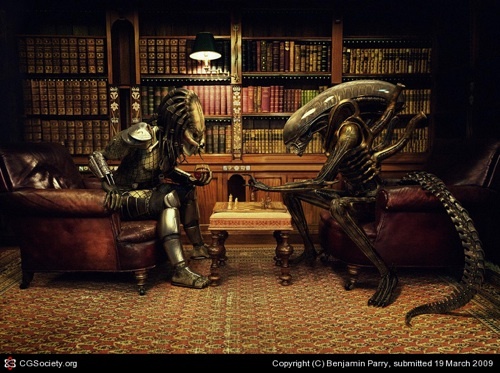 Very shortly after, Dark Horse obtained the rights to the properties and combined them in an Aliens vs. Predator comic book franchise. This quickly led to a series of video games, and in the past decade, two films. I'm a big fan of both franchises and the combined franchise. (I own every movie from both series on DVD, except for Predators, which is on my list to buy in the future.) Ironically, I didn't really watch them back when they first came out, but came to discover them in my adult years. And of course, the two series are both so popular, that crossovers were bound to occur, and indeed they have. When I first covered Alien/Predator for this blog, I placed them in the Whoniverse, but since then I've found that the overwhelming majorities are with the TVCU. My major decision in placing them in the Whoniverse was because of the very different future of Alien vs. the future of Star Trek. However, as I got more into how everything fits, I came to believe that the TVCU as a single universe can still have an infinite number of alternate futures. Thus, any events from Star Trek or Alien franchises that occur before the present day can all happen in the same TVCU timeline. Anything that occurs in a point in our future, would take place on their own separate timelines. Judge Dredd has had crossovers with Strontium Dog, Rogue Trooper, Batman, Aliens, and Predator among others. It even crossed over with its Spin Offson two occasions. In 2004 20th Century Fox released Alien vs. Predator along with the sequel Aliens vs. Predator: Requiem in 2007. There's no Toob World blog posts regarding either franchise, as it's a television based shared reality. Toby O'Brien would say the films are in the Cineverse, the comics in a comics based reality, and the video games in a video game based reality. However, Alien must have some variant, as Weyland-Yutani does have a presence in such shows as Angel and Red Dwarf. Here are some of the more recent posts regarding Alien and Predator in the TVCU discussion forum. Bonus. Here are three Alien/Predator related entries from my upcoming book, the Horror Crossover Universe! The Story: The Nostromo is a commercial towing spacecraft with a seven man crew on its way home to Earth while the crew sleeps in stasis. The crew is awakened when an unknown transmission is received and the company they work for, Weyland-Yutani, orders an investigation of its source on a nearby planetoid. Some crew members depart to investigate, and find what appears to be some kind of pods. One opens and out bursts a creature that wraps itself around a crewmember’s face. The crew rushes back on board, despite risk of contamination. The crew member who was attacked seems to recover, having had the “face hugger” removed and the ship departs towards Earth. However, before the crew returns to stasis, an Alien burst from the exposed member’s chest, and becomes a dangerous threat that seems to grow really fast. The crew then try to destroy the creature before they are destroyed, but one of the crew has ulterior motives. HCU Comments: This is a science fiction movie. But is is also most definitely a horror film. Weyland-Yutani was a client of Wolfram and Hart in the early 21st century, and that crossover connection solidly places Alien in the Horror Crossover Universe. However, the future of which the Alien film franchise takes place is only one of an infinite number of possible future timelines for the Horror Crossover Universe. There are many future stories with links to the Horror Crossover Universe, but with contrary versions of the fates of planet Earth, the human race, societal norms, and technological advances. All of them are still valid. Any of those futures could happen, but they all share a common history from the dawn of time to our present day. The Story: A Predator comes to Gotham and is killing off mobsters, inciting a mob war. HCU Comments: This would be the third Batman, Bruce Wayne Junior, for the sake of the Horror Crossover Universe. The Story: An expedition to the Antarctic discovers an ancient pyramid which is used as a training ground for Predators to be tested against Aliens. And it just happens to be training day. HCU Comments: This came out exactly a year after Freddy vs. Jason, and once more, my heart leapt for joy. Sure, the concept of Alien vs. Predator was old hat for Dark Horse Comics, who’d been doing those come crossovers for years. There had already been video games as well. But there’s just something different about seeing these two film icons meeting on the big screen. Robert E. "Robyn" Wronski, Jr.
Super-Spinoffs: Girl Power! Part II: The Complicated Timelines of Power Girl! Super-Spinoffs: Girl Power! Part III: Supergirls of the Television Crossover Universe! The Greatest: Floating like a Butterfly, Stinging like a Bee! 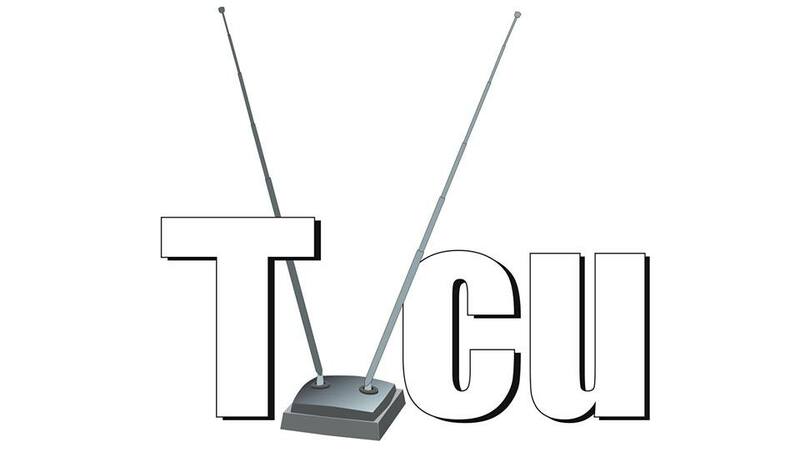 Purchase TVCU Merchandise at our store! Buy the Horror Crossover Encyclopedia on Amazon!!! Buy the Horror Crossover Encyclopedia on Goodreads!!! All characters, logos, and images are owned and © 2017 by current copyright holders. They are used here for educational purposes within the "fair use" provision of US Code: Title 17, Sec. 107. The contents of this blog has as its expressed content an EDUCATIONAL use of the other properties depicted. The ideas and views depicted on this blog are strictly those of the blog's owner and creator (and other contributors when noted). No claim on other people's intellectual property is actually claimed or should be inferred: all discussions and constructions made upon this site are as intellectual exercises. No slight upon any living person is intended and no direct references to individual persons alive or dead should be inferred either. The images and videos serve to be the best approximate representation of the characters and events involved. No photo or video was created for this site, but was the best representations to aid in describing an entry. The one exception are the "Television Crossover Universe" logo, designed by David MacDowell Blue, and property of Robert E. Wronski, Jr. and the "TVCU" logo, designed by Chlo'e Camonayan, and property of Robert E. Wronski, Jr. If any owners of copyrighted materials reproduced here object to the inclusion of their materials, those materials shall be cheerfully removed after the submission of a proper written request. And if I have made a mistaken attribution or failed to give credit on a posting, I shall cheerfully add that information when it is provided for me as well. (c) 2017 Robert E. Wronski, Jr.. Simple theme. Powered by Blogger.